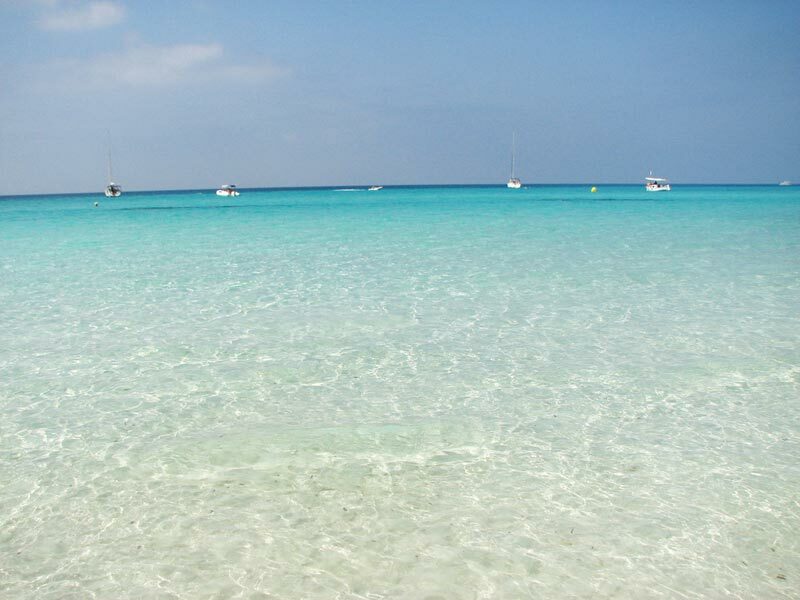 Mallorca has some of the finest beaches in Spain. 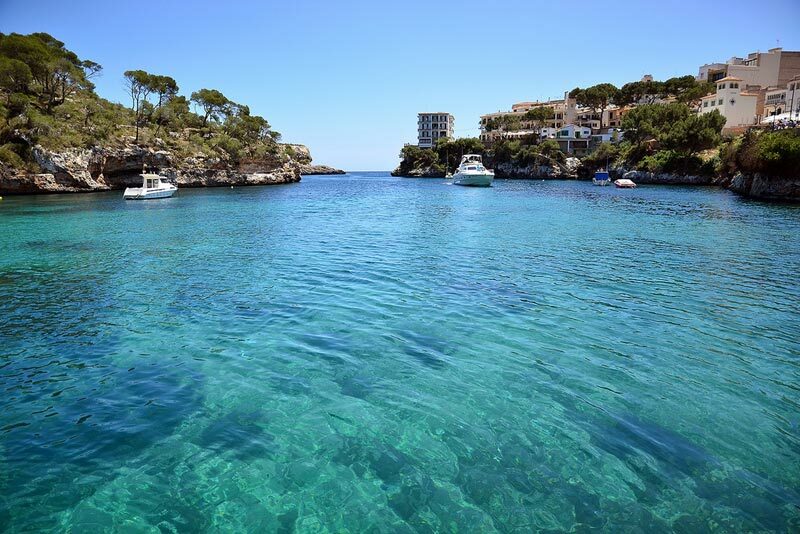 The largest of the Balearic Islands has a mild climate that allows for a peaceful bathing in the period from June to September; is, in fact, a particularly suitable destination for a beach holiday in Spain in different months of the year. 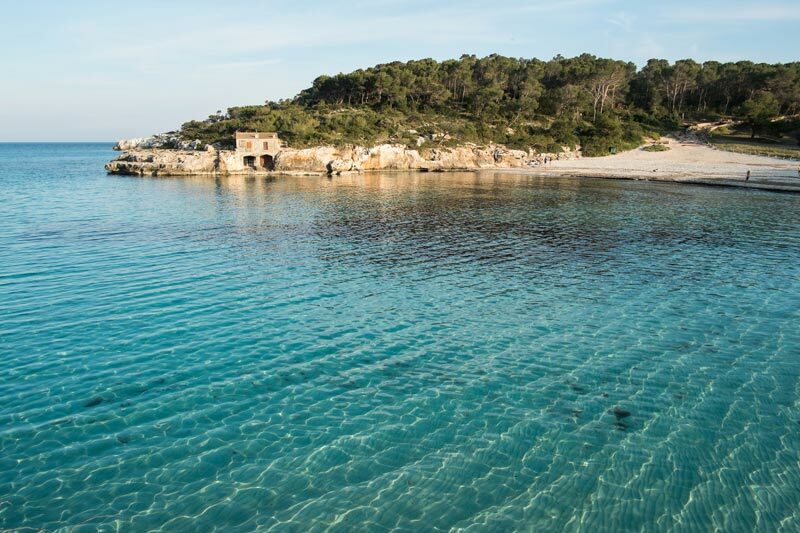 Given the varied landscape of its coastline, composed of more than 300 beaches in Mallorca we can find a perfect blend of urban expanses of sand and coastal paradise yet to be discovered, all characterized by crystal clear waters. 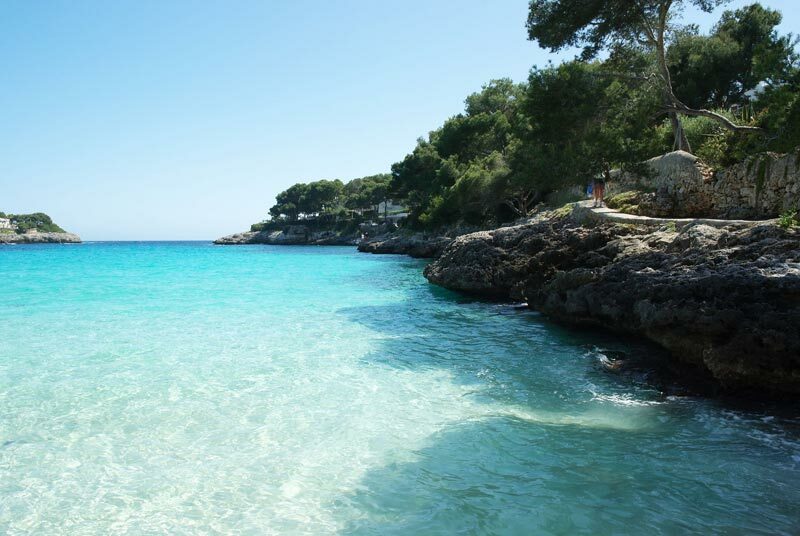 Blocks or full of life, equipped or wild, composed of fine golden sand or rocks and gravel, in any way you present the coasts of this spectacular island, equip yourself with sunscreen and follow us to the discovery of the 10 most beautiful beaches in Majorca. If you are planning to take a vacation in this island, also read our travel tips for a holiday in Majorca. 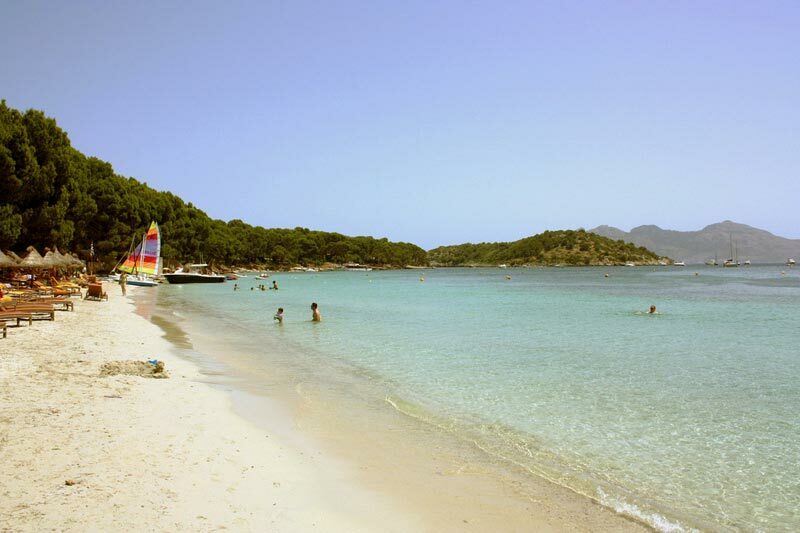 Probably the most famous beach of Mallorca, Es Trenc has about three kilometers of white sand dunes and a turquoise sea and transparent very similar to that of the Caribbean. Situated south of the island, the beach is located just 15 minutes from the village of Campos, in recent years, has been recognized as the symbol of the ecologist fight against urban sprawl, making it a natural area of social interest. Es Trenc is easily accessible by buses that run every 30 minutes. Although very busy during July and August, however, it is considered a relaxing and rejuvenating beach thanks to the presence of the only island’s hot springs. In Majorca the less frequented beaches alone and only come on foot or by boat and this is the case of Es Pregons Grans and Petits. Reach of Es Trenc with a walk lasting about 15 minutes, these two beautiful beaches offer wonderful sandy languages stretched the sea and surrounded by the typical scent of the Mediterranean. Dotted with dunes and small shrubs, appear to be the favorite with nudists here you grant many spaces of relaxation, thus managing to escape from prying eyes. To the southeast of Mallorca, in the district of Santanyí, it is Cala Mondragó. Awarded the Blue Flag and declared a Natural Park since 1992, this wonderful beach, despite being one of the busiest places on the island, still has an unspoiled landscape with its lush vegetation. The coast consists of two small coves: the first is easily accessible, located a few meters from the bus stop, the second, however, can only be reached by crossing a footbridge on the rocks. 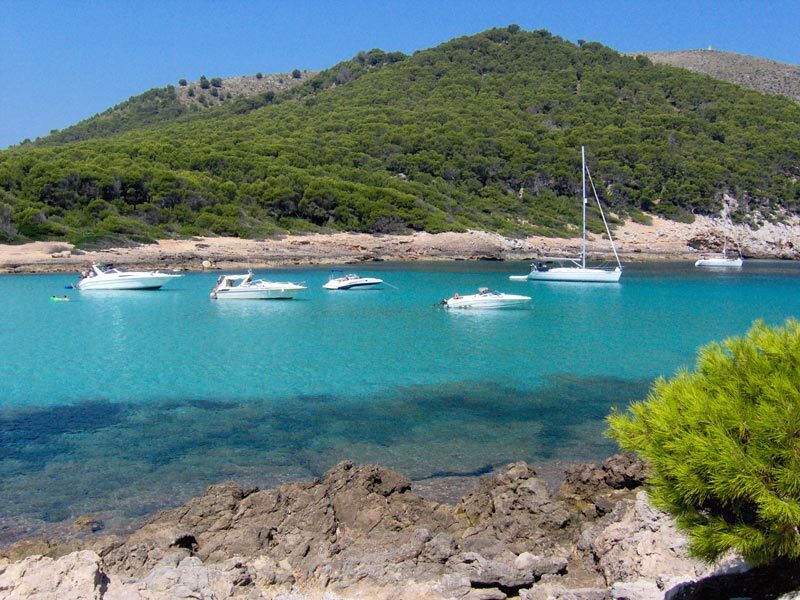 In some places, Cala Mondragó also offers a pleasant shelter from the sun thanks to the green environment that surrounds it, formed by pines and junipers. In the north of the island, 5 kilometers south-east of the village of Santanyí and the end of the Formentor peninsula, we find the magnificent beach of Cala Figuera. Surrounded by cliffs overlooking the sea, it is reachable only by sea or by a steep path. This magnificent bay is surrounded by dense vegetation that is reflected in a beautiful cobalt blue sea. The absence of a real beach is filled with the wonderful spectacle of the landscape that presents the Bay. The area is popular with local fishermen with their boats and their nets, each day compete in the fishery, characteristic of this area. 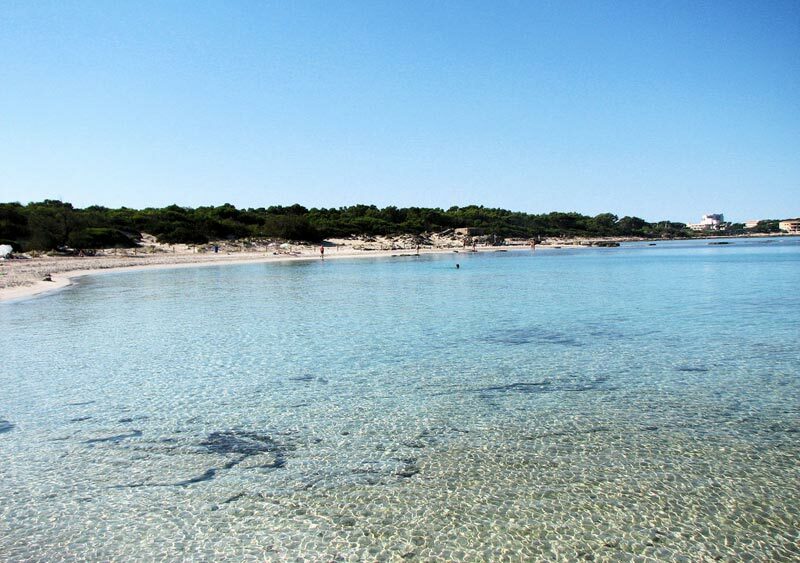 This beautiful beach is located about two kilometers from Capdepera and is part of the Natural Area of Special Interest. For this reason, this side of the coast appears to be devoid of tourist facilities, but surrounded, however, by a lush pine forest. Cala Agulla is reached by following the steps on the road connecting Capdepera to Cala Ratjada, then leaving the car in a convenient parking. Bounded at the end by a rocky area, it consists of a lovely soft sand beach with a sloping sandy bottom and crystal-clear sea. 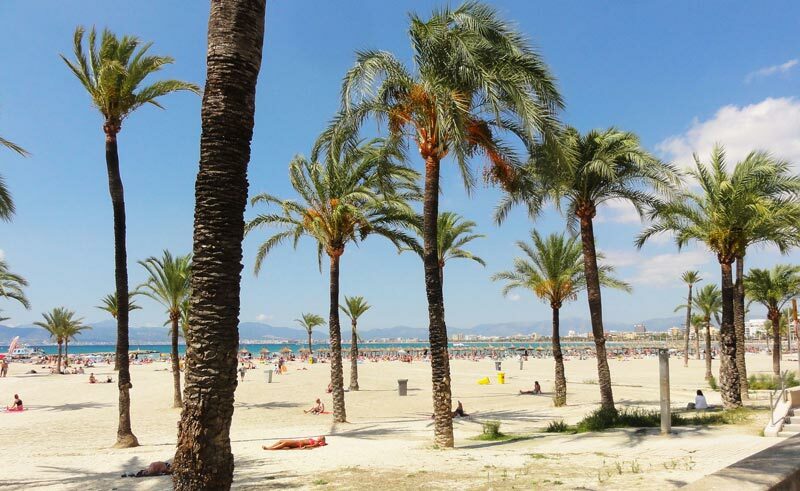 The S’Arenal Beach is the largest beach in Palma de Mallorca: 1.5 km Free and equipped coast, consists of fine sand and surrounded by beautiful pine trees. Being the town beach, it presents a day a high degree of crowding, while in the evening, thanks to the presence of several local, is alive with young people, as is the case in many beaches of Ibiza. S’Arenal is frequented by tourists, especially of German origin, and families, thanks to the multitude of offers that fit their needs. Because of the constant presence of the wind, S’Arenal is also a popular place among windsurfers. Located about 14 km from Port de Pollença, in the northern part of the island, Cala Formentor is located within the homonymous bay. Accessible either by its own means or by public transport, this coast has the characteristic mountains on either side and a beautiful golden sand that slopes in a shallow water. Bordered by a magnificent pine forest, it has some structure to rent umbrellas and sunbeds. To take some amazing photos, we recommend a trip on the cliffs of the nearby lighthouse, which offers stunning views of the island of Menorca. Cala Egos is an unexpected paradise off the beaten paths of tourists, and is the ideal place to spend your days surrounded by nature. To get to this spectacular place we must start from the port of Andratx, in the south-eastern part of Mallorca, take the Avinguda Gabriel Roca and continue towards the residential area of Montfort; From here a path of about four kilometers that reaches the beach. This little cove is very reminiscent of some wild coves of the Canary Islands, because of its nature. Devoid of any service, it is a must for all lovers of virgin landscapes and unexplored. In a beautiful bay surrounded by towering mountains are one of the most picturesque bays of Mallorca. 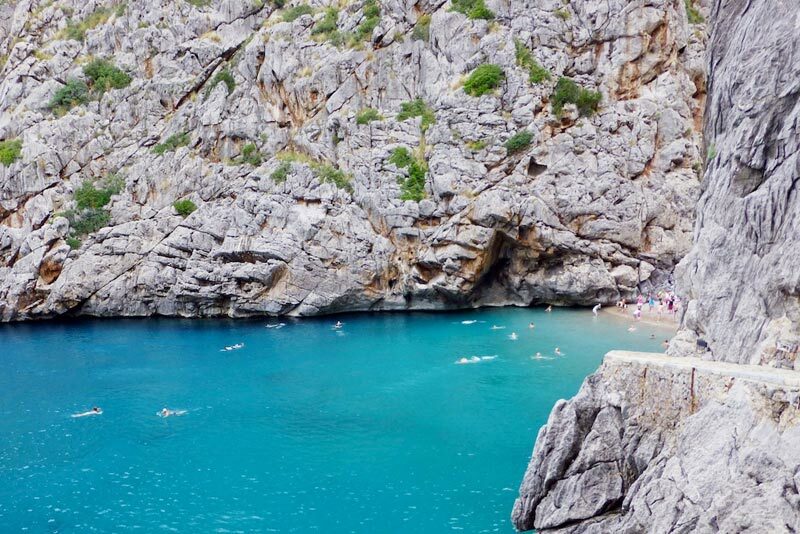 Located in the northwest area of the island, Sa Calobra is composed of white stones and is characterized by cliffs that overlook the beach, taken from the walls of a canyon carved out over the years by the river Torrent de Pareis. The beach, for its particularity, it looks like a real movie scenario: through a pedestrian tunnel through the rocks, you can get to the canyon of the river, more than two kilometers long and consists of high rock walls over 200 meters. In the summer months, when the river is dry, tourists can reach the sandy expanse along a fascinating trek that starts from the town of Escorca. 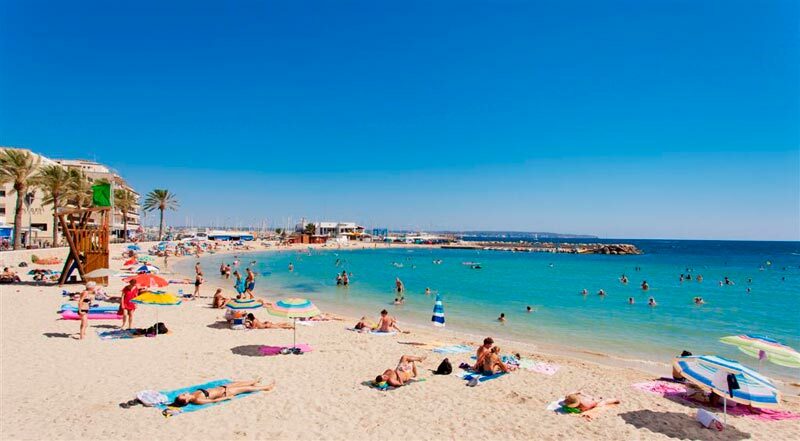 It is located about 10 km from Palma de Mallorca and its context, its cleanliness and its services was awarded the Blue Flag beach. Located between the famous Maritime Club of St. Anthony and Cala de Caios, Cala Estancia measures over 200 meters in length and is composed of a thin and white sand. The beach has a shallow bottom and is surrounded by hotels and residential facilities. On the seafront, in many places closed to traffic, you can find numerous shops, restaurants and rental bicycles and skates points. Unspoiled landscapes, natural caves, but also large stretches of sand, clean and transparent sea, nightclubs and modern tourist attractions: this is what it offers tourists the magnificent Mallorca! If you decide to spend your holidays on this island, you will have the opportunity to experience a diverse holiday that will give you surely unforgettable days.